Home Kitchen Accessories Are You an Angel or a Devil? In Coffee Cups at Least! Are You an Angel or a Devil? In Coffee Cups at Least! Well are you an angel or a devil?? I always say that my halo is balancing on my devil’s horns – so that kinda covers both options! 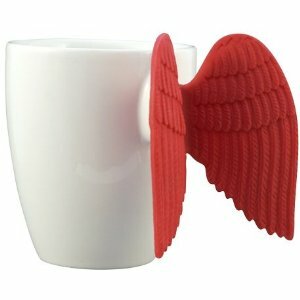 When it comes to these coffee mugs I have to say I love Pylones Angel Time Coffee/Tea Mug. Sometimes I am a bit slow on the uptake, so it took me a moment (or six) to figure out how to hold this mug but the wings are made of heat resistant, flexible silicone, so that might just be a clue! Now you might be in a more devilish mood and that’s ok too! The Knight Death Devil Art Mug by Albrecht Drurer might appeal to your darker side. So angel or devil – come on fess up! Previous articleAlessi Kettles – Do They Blow Your Whistle? Alessi Kettles – Do They Blow Your Whistle?